If you’re familiar with social selling, then you know why many marketers and salespeople are turning to this strategy to prospect and convert quality leads. 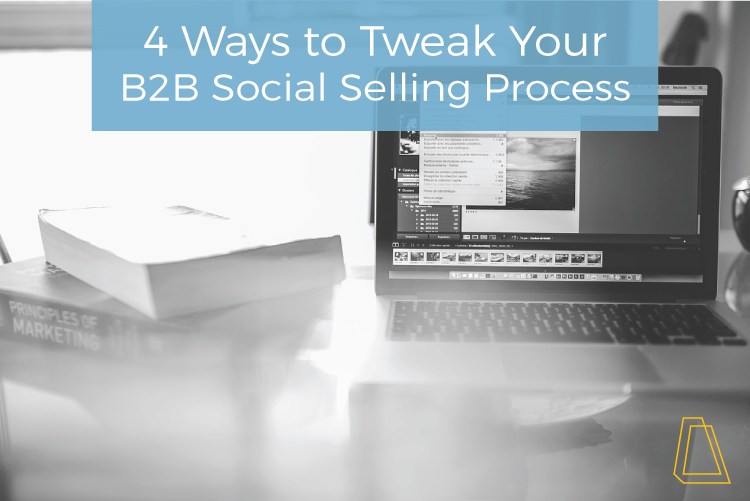 Are you implementing social selling at your business? If so, you might want to consider the below tweaks to your process to delight potential buyers (and customers) even more. 1. Take targeting a step further. You know that when B2B social selling is done right, you’re providing value because the content you share matters to your prospects. However, you could be sending even more targeted messages! A common “mistake” of social sellers is that they tend to look only at the industry of their prospects. For example, if I’m selling insurance technology, I might just target people in the insurance industry, but I’m not digging in any deeper. Doing this will help you find or create even better content to share that will grab their attention. After all, those professionals in your industry aren’t cookie cutter people—they’re individuals with their own specific challenges and goals. It can be very easy to do the bare minimum and still hope for and expect, better results. Don't do the bare minimum when it comes to engagement. Many social sellers rush through the process and end up simply “liking” and sharing a bunch of content to their entire network. That’s not effective. Do more. If a prospect asks a question, answer it. Finding your prospects on Facebook groups, LinkedIn groups, Quora, or other forums is a great place to start. Take the time to create thoughtful and specific messages. The more tailored you are in your approach, the better. This doesn’t mean you have to stop doing the basics, but they should be a part of, not your whole, engagement strategy. 3. Focus on current customers, too. Social selling is, after all, meant to delight prospects. So why not also continue to delight customers? This rings especially true if you have opportunities to upsell or cross sell. When you continue to provide value to customers, they will buy into your business further, whether that’s retaining them during contract discussions, or considering additional products or services from you at a higher price point. What’s more, many of your customers are also your best salespeople. In fact, prospects who are referred to you by your customers are 4 times more likely to buy. So the next time you consider whether or not to send a customer an article they might find helpful, think about all the people they can reach, and do it! 4. Keep a top list, and refresh every 1-3 months. Some sales and marketing teams go into social selling without a plan. Sure, they have general guidelines on what they’ll do; they know they’ll engage and interact with people, and so on, but sometimes it pays to spend time strategizing. To start, make a top 25 prospect list (this number could be more or less, depending on your business). As most salespeople know, your top prospect list usually includes companies/decision makers who are potentially high-revenue customers for your company, are a great fit, and/or seem very likely to close. With this information in mind, start using this list to social sell! And make sure to update this list every 1-3 months, depending upon how short your sales cycle is. There you have it! If you’re looking to improve your social selling process further, check out our Social Selling Workbook. Have any other advice? Let me know in the comments below!